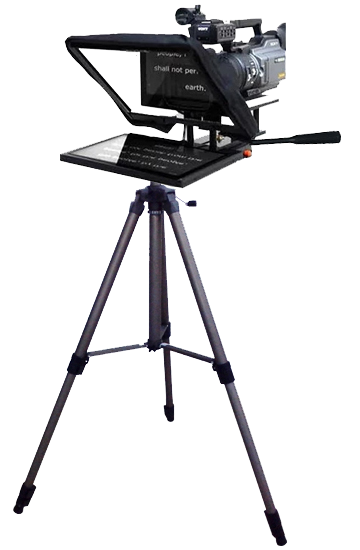 The basic structure of a teleprompter consists of a heavy-duty tripod stand, which supports the entire system. A metallic and height adjustable tripod stand is expected in a teleprompter system so that the height of the system can be adjusted according to the height of the speaker to see the reflected script clearly at the right angle of vision. A specially customized rig is mounted to the tripod stand to hold all the components and integrated electronic parts. The rig of the teleprompter is sturdy and stable, eventually holding all the components of the system firmly. We advise you to buy teleprompter from a trusted manufacturer or seller. Another most important part of the teleprompter system is the mounting rail for the recording camera. This is a specially designed mount for the recording camera and again it also needs to be strong and sturdy enough, preferably metallic, to hold the expensive recording camera at a height to record a video from the very front of the speaker without taking the teleprompter system into view. The mounting rail is customized and designed in a way to mount almost any model of camera. A separate pivot provision is added to the mounting rail to flexibly adjust the position of the camera from the front reflecting mirror. Thus, these crucial parts of the teleprompter system form the main and backbone of the system. The manufacturing of such teleprompters includes highly specialized designer and technical engineers to produce the structure with all the provisions and functionalities with ease of use. For a better view of the script, you should buy teleprompter with a 32-inch monitor. A brief survey of various cameras and their compatibility. There are so many first-time buyers who work with small cameras and tripod heads and don’t have anything appropriate for the weight of a teleprompter. The second question is if you can position your camera and lens in the back of the teleprompter glass to the hood so that the eye line of the presenter is directly looking at the camera. This depends on the specific camera and lens you’re using, and the flexibility of the mounting system in your chosen teleprompter. For the most flexible camera mounting systems and advanced cameras or lens, get a flexible teleprompter mounting system, which there are many in the market. Because of the increased flexibility in the mounting system, all lens and camera types can remain flush against the tripod head while still remaining centered on the glass. There are some things that need to be taken into consideration when it comes to choosing the perfect video camera teleprompter for your studio. The first thing you should consider is the range of distances you are operating on it. This helps you figure out the size of the teleprompter you need for your studio. Your ideal teleprompter should also be compatible with cameras of different sizes for your ease. The DSLR camera can be very easily mounted to the standard 15mm rail system of the teleprompters. The camera unit slides on the rail and is fixed in place by screws. The teleprompter system can be used with DSLR cameras which features large sensors, a large number of lenses to choose from and a fraction of cost of the standard setup. A high-quality PTZ camera can be mounted inside a teleprompter system can be focused conveniently to have an eye to eye contact with the speakers in a boardroom and a conference room. A PTZ camera when used for telepresence, teleconferencing and standard presentations and prompting. No other solution offers the same eye to eye contact for the most convincing communication. A PTZ camera also offers various connection types to connect to the prompting computer system. If you want to buy teleprompter, first get all related information and compare two or three teleprompters.